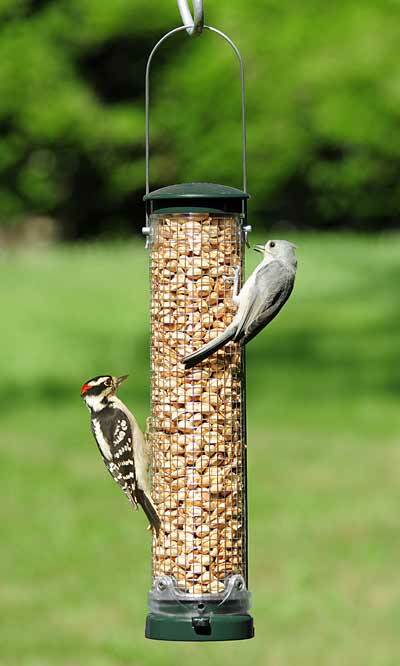 Place a fantastic new feeder for nut-eating birds in your backyard with the Aspects Spruce Quick-Clean Peanut Mesh Bird Feeder. Adding a peanut feeder to your bird garden invites a larger variety of birds to the area, for a busy and exciting feeding zone. The stainless steel mesh tube holds 0.8 quarts of peanut chunks easily, and its 0.25" square openings allow birds to access the feed. Its clever, perchless design enables a few clinging birds to eat at once, and prevents other birds from reaching the food. The dark green, metal cap and base blend into the natural surroundings, while a robust polycarbonate ring at the top of the item helps the tube retain its shape. Additional polycarbonate at the bottom forms a baffle, ensuring the seed tube empties fully, and supports the innovative, Quick-Clean base. This hefty base removes from the reservoir in moments by squeezing its two plastic tabs, for a feeder which is easy to clean and maintain. Drainage slots here also keep the peanut chunks dry and fresh, while the steel and metal body withstands the rigors of use outdoors. An integrated port on the feeder allows it to be pole mounted with a threaded adapter (not included), or the unit can hang from a hook with its attached metal loop. Encourage a variety of birds to dine in your backyard from this Spruce Quick-Clean Peanut Mesh Bird Feeder. Made in the USA. Lifetime guarantee. Capacity: 0.8 qts. ; 1.2 lbs.